Diwali or Deepawali is the festival of lights. We all are eager to celebrate the festival of lights which is the best festival as well as opportunity to please Mother Mahalakshmi, the eternal consort of Sri Hari Vishnu who is served by millions of Lakshmi as servants. Diwali is called Mahanisha or a great night whereby the energies or the Ten Mahavidyas and other things roam here and there freely. Srimati Lakshmi comes to this material world to listen to the prayers of her devotees and bless them with immense amount of wealth. We, at shubhpuja present you the most authentic and practical method of Diwali puja. Diwali puja needs the following items. 16 shringar- Mehandi, Comb, Nail polish, Kajal, Lipstick, bangles, Bindi, Mirror, Itrae etc. The method of worship is simple and is as follows. One must take a bath and wear new and fresh cloth. If possible, one must apply Vishnu tilak on his forehead. One must spread a clean red cloth on a chawki and place the idols of Lakshmi Ganesh in them and must wipe them with a clean wet cloth. They must face east. Take a fresh coconut and wrap around a red cloth with a mauli and put them on a water filled copper kalash wish five mango leaves on the top. One must make Om and Swastik on the kalash. One must make nine heaps of rice near the kalash and draw swastik nearby. One must make 16 small heaps of rice near Lord Ganesha and worship them. Take a thali. Make Swastik and put Supari, sarvaoshadhi, saptmatrika and everything on it except Achamani, agarbatti, dhoop and puja book. One must light ghee and oil lamps before them and worship them. One must offer fresh flowers, rice and laung to them. One must sing Lakshmi aarti and Ganesh aarti and offer lamps to them. 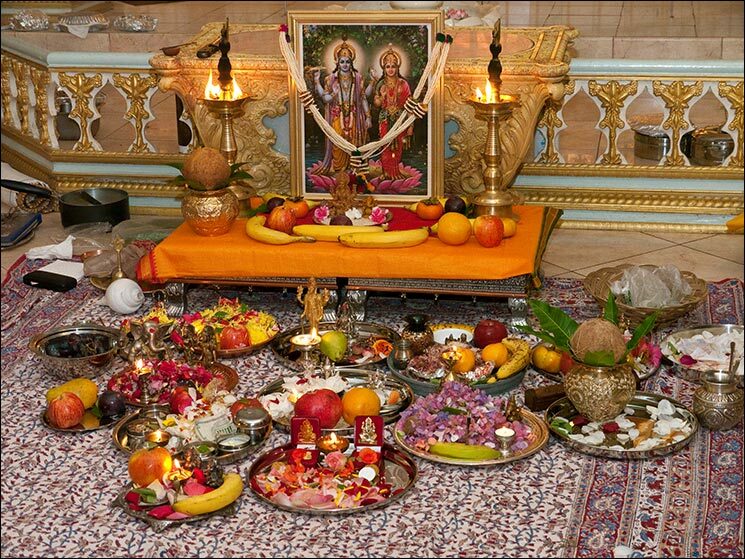 One must offer sweets to Lord Vishnu and Lakshmi and then to Lord Ganesha. One must sing various bhajans and then, put the lamps in the house. For more detailed information, please contact us at http://www.shubhpuja.com. This entry was posted in Puja and tagged dipawali, diwali, Diwali puja, festivals, puja, puja ceremony, puja package, puja samagri, puja services, puja vidhi, pujan, Shubh, Shubh Deepavali, Shubh karya, Shubh puja, shubhpuja, shubhpuja.com. Dhanteras or Dhanvantari Trayodashi marks the beginning of the tyohara panchaka or the five festivals which come in a single line. It starts from Dhanteras and ends up at Bhaidooj and all of them have got their own importance in the matters of celebration and their rituals. Dhanteras or Dhanvantari trayodashi is said to be the day of Samudra manthan which is the churning of celestial ocean byu demigods and demons. All of them agreed to churn the ocean with vasuki as the rope, mandaranchal mountain as the churner and Lord Krishna who took the form of a tortoise as the pivot of keeping the churner. On the thirteenth day of such huge churning, finally Lord Dhanvantari appeared with a pot full of nectar. Hence, it is termed as Dhanvantari Trayodashi. All the ayurvedic doctors celebrate this day since Lord Dhanvantari is the incarnation of Lord Krishna who appeared to give the knowledge of Ayurveda to the world. On this day, one must worship a tulasi plant on the threshold of the house keeping her above a rangoli. One must light four diyas in the four direction, sit and pray to her and after that, one must circumbulate her four times. One must worship Lord Dhanwantari in the evening who is supposed to bless the house and the person with sound health and sane mind. Since Dhanvantari trayodashi reduced itself to Dhanteras, people think it as a day when something is to be bought and collected. Hence, on this day people are found in the market and are seen purchasing something new for the house. It is prescribed in the shastras that one must purchase a precious item made of Gold, Silver, Diamond ot any other precious item which invokes auspiciousness. One must perform Dhanteras puja at house and must seek blessings of Mahalakshmi devi. 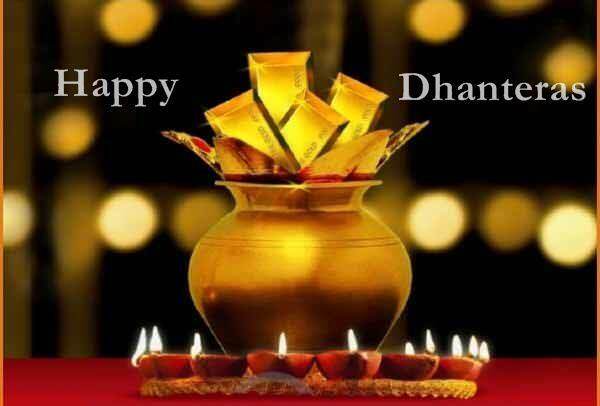 This entry was posted in Puja and tagged Dhanteras, DHanwantari, dhanwantari trayodashi, diwali, Diwali puja, puja, Shubh, Shubh Deepavali, Shubh karya, Shubh puja, shubhpuja, shubhpuja.com.